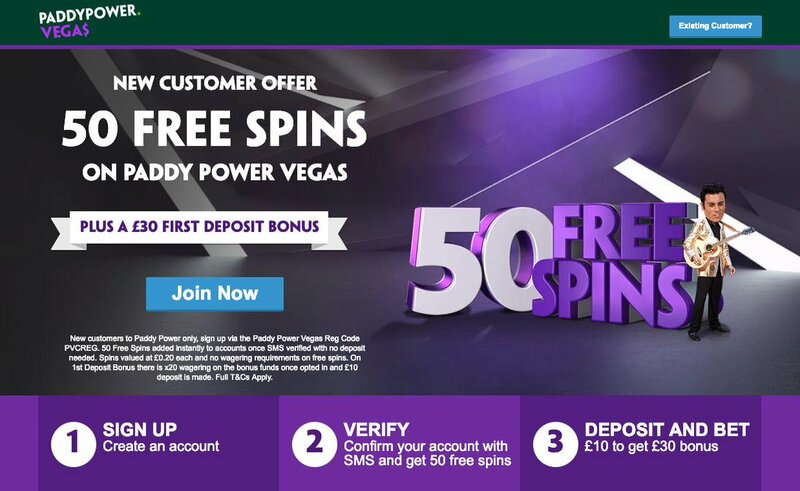 All Paddy Power Vegas NEW CUSTOMERS get a whoppy 50 Free Spins on Paddy Power Vegas Tournament Slots Collection once they Opt In and complete the registration process! The Free Spins come with no wagerging requirements! Plus, deposit and bet £/€10 to get £/€30 bonus! AS SEEN ON TV! It takes no more than 2 minutes... seee below! 2. Sign up to Paddy Power Vegas or use you existing account and visit their casino section. 3. You will receive 50 Free Spins. The free spins each have a value of £/€0.20 and have no wagering requirements. No deposit is needed! 4. Yu must opt in on-site, and supply a valid telephone number. You will then be sent a validation code to that phone which you must enter on site to redeem the no deposit free spins. 50 no deposit free spins added to accounts verified by SMS (x1 wagering). The offer is available to new Paddy Power customers from UK or Ireland. How To Play In The Paddy Power Slots Tournaments? The Paddy Power Vegas tournaments are really easy to get involved in. They are all scheduled, and players can choose to join the next available one. Players can launch the eligible slot, take a look at the rules and enter their nickname for the leaderboard. They will have a certain amount of time to spin to reach the top of the leaderboard. Once the time is over and all spins have been used, the winners will be awarded their prizes. Ancient Script, Arcade Bomb, Ball of Shame, Bullfight, Chinese Treasures, Cinderella's Ball, Classy Vegas,Crazy Genie, Diamond Rush,Divine Ways, Dragons Fire, Dragon's Luck, Dragon's Luck Power Reels, Dragons Wild, Easter Money, Elven Magic, Epic Journey, Esqueleto Mariachi, Five Star, Fortune Charm, Fortune Fest, Fortune House, Fruit Stack Deluxe, Fruit Stack Mega Wheel, Gem Blast, Gems Gone Wild, God Of Wealth, Golden Kingdom, Golden Temple, Golden Lotus, Golden Offer, Golden Thunder, Grand Wheel, HalloWin, Imperial Palace, Irish Clover, Jade Charms, Jester Spins, Jingle Bells, Jousting Wilds, Laser Fruit, Lion Dance, Lucky Cabaret, Lucky Fortune Cat, Lucky Halloween, Lucky Valentine, Lucky Wizard, Magic Fairies, Magic Gate, Masquerade, Mega Jade, Midas Gold, Mississippi Queen, Money Machine, Money Night, Money Tower, Mr & Mrs Diamonds, Mystery Reels, Nudging Gems, Paddy Power Fan-atics, Persian Fortune,Phoenix, Rainbow Jackpots, Ra's Legend, Reactor, Reel Heist, Reels of Egypt, Rhino Rumble, Rocket Men, Royal Goose, Russian Glory, Solar Snap, Stage 888, Sumo Spins, Ten Elements, Three Kingdoms, Three Musketeers, Tiki Fruits, Totem Lightning, Totem Lightning Power Reels, Treasure Mine,Trick O Treat, Tumble Dwarf, Wild Circus, Wild Egypt, Wild Fight, Wild Nords, Wild Sheriff, Wild Wild Chest, Winter Wonders. You will receive 50 Free Spins for use on Paddy Power Vegas Tournament Slots Collection. The free spins each have a value of €0.20. Only customers who are new to Paddy Power Vegas are eligible for this bonus. You must opt in on-site and supply a valid telephone number. You will then be sent a validation code to that phone, which you must enter on site to redeem the free spins. Once validated, launch any of the eligible Paddy Power Vegas Tournament Slots to claim your spins. 3. HOW DO I QUALIFY FOR THE NO DEPOSIT SPINS? The offer is available to new Paddy Power customers in the UK & Ireland who have a valid mobile number. 4. CAN I PLAY ON MY SMARTPHONE OR TABLET? There is a fantastic Paddy Power Vegas app which is available for you to download for free right now. 5. SHOULD I USE A PADDY POWER VEGAS PROMO CODE? Yes. Using the bonus code PVCREG, new players will get 50 no deposit free spins added to their account. Plus, we have a special section where we collect all the no wagering casino offers! Visit it now! "Paddy Power Vegas 50 No Deposit Free Spins! No Wagering Requirements!"